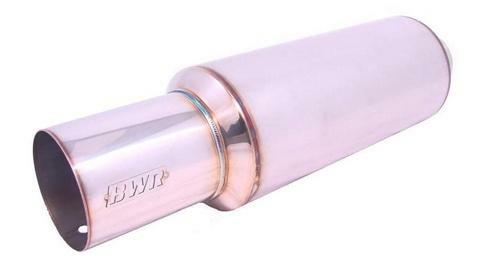 BWR Universal Pro Sport Muffler UNIVERSAL - Dezod Motorsports Inc - Home of the automotive performance enthusiast since 2002. The BWR Race Mufflers were designed to out flow and out perform all other mufflers on the market while still retaining a nice quality sound pitch. They are constructed from 304 stainless steel and are masterfully hand tig welded to ensure the highest quality muffler available.Blackworks Race mufflers are available in a 2.36” and a 3” inlet to suit nearly everyones needs and both sizes have a 4” polished outlet.BWR Mufflers come with a Lifetime Warranty.